Chicago sits like a sparkling jewel on the shores of Lake Michigan. The Windy City is known for skyscrapers, iconic "El" train to The Loop, and deep dish pizza. 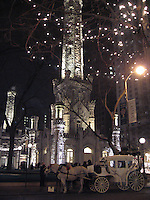 The elegant Water Tower survived the Great Chicago Fire and welcomes visitors from around the world to Michigan Avenue and State Street. The Second City is known for its friendly folks, diverse cuisine, championship sports teams, world-class museums and unique architecture. It's what makes Chicago My Kind of Town.